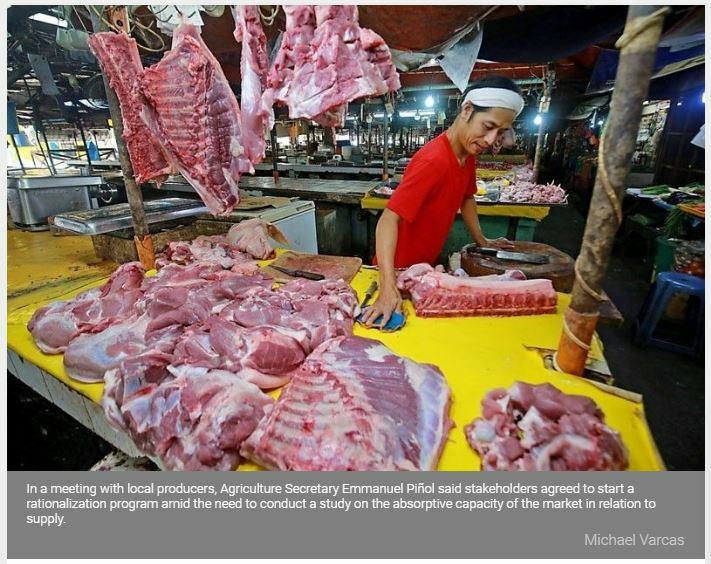 MANILA, Philippines — The Philippines plans to slow down the processing of meat import permits amid the current oversupply which is affecting the local hog and poultry sectors. In a meeting with local producers, Agriculture Secretary Emmanuel Piñol said stakeholders agreed to start a rationalization program amid the need to conduct a study on the absorptive capacity of the market in relation to supply. “Pending the rationalization of the industry, we may have to go slow on the issuance of new import permits. If we continue with the volume of importation right now, the market will certainly choke and everybody will lose money,” Piñol said. Data showed that inventory in the cold storages right now have reached 27.8 million kilograms of chicken and 34.3 million kilos of pork, already good for about three months. The current inventory is too much for the market to absorb which in turn, is affecting the drop in prices of local pork and chicken produce. “We have to make sure there is a corresponding withdrawal from the cold storage and make sure that the volume of importation will not go beyond what the market can absorb,” Piñol said. “Local hog raisers should be able to release their stocks first because those in the cold storages can actually wait but our backyard hog raisers need to sell their produce at a certain period,” he added. Piñol said there is no need to bring in more stocks following the oversupply in the market. “The stocks are really too much. Our producers are already crying because they can’t release in the market because the cold storages are overflowing,” he said.